Our Tangerine Lemon Scentsy Oil is purely bright and blissful. This oil is bursting with fragrance notes of elevating lemon, sweet tangerine and hints of crushed fir needles. 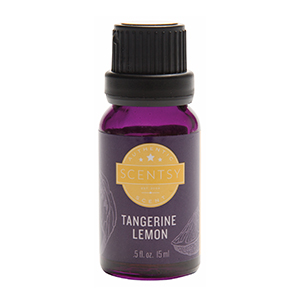 This Scentsy100% Natural Tangerine Lemon Oil will add joy and bliss to your day. With 10 – 15 drops in your Scentsy Diffuser , you’ll change your mood to happy, bright, and fun –truly a breath of happiness.